” Chief Prosecutor of the National Anti-corruption Directorate (‘DNA’) Laura Codruta Kovesi said on unveiling the body’s 2014 results on Tuesday that last year saw a range of firsts since the DNA was set up, namely the highest number of recorded and settled cases, the highest number of indictments and sentences as well as the highest number of high-ranking officials that were probed into. ” As many as 86 prosecutors who conducted prosecution activities in 2014 had to resolve more than 9,100 cases, the highest such number since the DNA was set up. On average, a prosecutor carried out the prosecution of nearly 105 cases, an impressive volume given the complexity of the files that Directorate is tasked with. The number of the indictments increased significantly in 2014, with 317 indictments having been drawn up, which shows the prosecutors’ concern to chiefly solve the cases having judicial finality. The statistic figures confirm the efficiency of the DNA activity as well as the fact that the investigatory resources are being channelled towards the causes with judicial finality’, the anti-corruption body’s chief said. Romania’s justice system seems to have woken up in recent months, sending important local politicians and business people behind bars. Some of them are already serving their sentences while others are placed under preventive arrest, and are investigated in one or more cases of corruption, tax evasion or money laundering. Former Youth and Sports Minister Monica Iacob Ridzi was sentenced to five years in prison in early-February this year, for abuse of office. The five judges who made the decision in this case found Ridzi guilty of abuse of office related to the organizing of the Youth Days (Zilele Tineretului) festivities, in 2009. Read more about this case here. Former Transport Minister Miron Mitrea was also sentenced to prison recently, for corruption. Romania’s High Court of Cassation and Justice ruled two years in jail for Mitrea and the decision is final. Click here to read more about the case. In January this year, the High Court of Cassation and Justice sentenced former Economy Minister Codrut Seres to four years and eight months in prison, in a case of economic espionage. The court ruled jail sentences totaling 44 years in this case, no parole, for ten former ministers, state secretaries and private consultants. More about it here. Former Romanian Transport Minister Relu Fenechiu currently serves time after the court sentenced him to five years in jail, no parole, in a case nicknamed “Transformatorul”. More about the case here. Former Communication Minister Sorin Pantis was convicted in two separate cases. Last summer, the court sentenced Pantis to seven years in jail in the privatization of the Institute of Food Research. Later the same year, the Bucharest Appeal Court sentenced him to two years and eight months in prison in the Rompetrol case. Romanian journalist and senator Sorin Rosca Stanescu also got two years and four months in this case. More about the Rompetrol case here. In 2012, former Agriculture Minister Ioan Avram Muresan was sentenced to seven years in prison, no parole, for embezzlement. One year later, in 2013, he got another jail sentence, of three years, for trading influence. Decebal Traian Remes, another former Romanian Agriculture, also got three years in jail in this case. Romanian businessman George Copos, the former owner of Rapid football club and owner of several hotels across Romania, was convicted to three years and eight months in prison, without parole, in a case involving transfer of football players. Several other football bosses received jail sentences in this case, such as Cristi Borcea – former owner of Dinamo football club, Mihai Stoica – general manager of FC Steaua Bucuresti, Ioan and Victor Becali, former football star Gica Popescu, Gigi Netoiu and Jean Padureanu. Read more about this case here. In 2014, Copos was sentenced to another 4 years in jail, no parole, in a tax evasion case nicknamed Loteria 1. More about it here. Romanian businessman and football boss Gigi Becali, owner of FC Steaua Bucuresti football club, is currently serving a three and a half year jail sentence for corruption in a land exchange deal, kidnapping and football match fixing via bribery. Read more about these cases here and here. 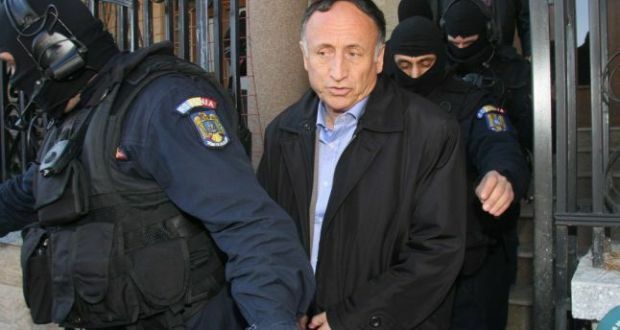 Romanian media mogul and politician Dan Voiculescu, founder and owner of the Antena media group, was sentenced last year to ten years in prison, no parole, for his involvement in the privatization of the Food Research Institute (ICA). Apart from Voiculescu, 12 other people were sentenced to various terms in jail, with or without parole. More about this case here. In late-January this year, the Supreme Court rejected Voiculescu’s appeal. Mihai Necolaiciuc, former general manager of Romania’s railway company CFR, was found guilty of a EUR 2.7 million fraud and was sentenced to four and a half years in prison. More about it here. Romanian businessman Marian Iancu was sentenced to twelve years in jail for tax evasion and money laundering in RAFO case. The sentence was final. Read more about it here. Iulian Hertanu, Romanian Prime Minister’s brother-in-law, was recently arrested for 30 days on charges of embezzling European funds. President of the Prahova county council Mircea Cosma, his son Vlad Cosma, who is a member of the Parliament, as well as businessman Sebastian Ghita, also an MP and a close friend of Ponta’s were placed under judicial control in this case. Read more here. Romanian businessman and media mogul Adrian Sarbu was arrested for 30 days in early-February in a tax evasion case. More here. Former Interior Minister Cristian David is another top politician currently under preventive arrest. He is investigated in a corruption case, for taking bribes. More about it here. Former Romanian boxer and former president of the Romanian Boxing Federation Rudel Obreja was arrested for 29 days for alleged influence peddling. More about this case here. Romanian businessman Dorin Cocos is currently serving preventive arrest in the Microsoft IT licenses case. He also received an arrest warrant in another case connected to the illegal land retrocession file under which the former chief prosecutor of the organized crime directorate DIICOT Alina Bica is also serving preventive arrest. Alin Cocos, the son of Dorin Cocos, was also arrested in this case, together with former Bucharest mayor Adrian Videanu. However, Videanu was released from jail and placed under preventive arrest. Romanian politician Viorel Hrebenciuc and his son Andrei Hrebenciuc were also arrested in the illegal land retrocession case. In late-December 2014, the court decided to replace the measure of preventive arrest with home arrest for Andrei Hrebenciuc. Former minister and Presidency candidate Elena Udrea was arrested on February 10 in the Microsoft IT licenses case. However, a few days later, Udrea managed to convince the High Court to overrule the 30-day arrest warrant in her name and to place her under house arrest. More about it here. Mircea Basescu, the brother of former Romanian President Traian Basescu, was arrested in June last year for taking bribes. In November, the court decided to place him under house arrest. Read morehere. Arrest in January 2015 of ex-cabinet minister and presidential candidate Elena Udrea.